Translating data into simple stories and vice versa. Did you know that Spain has the greatest number of bicycle sharing systems in the world? Having a high demand for these makes a lot a sense - the mild winter leaves one no bad-weather-excuses for not biking; and in the summer the bicycle is the most pleasant transport method for going to the beach. But if you have ever tried to go to the beach on the bici (that's how the public bikes are called in Barcelona) on a lovely Sunday morning, you've probably stumbled on your closest station being empty. So you walk under the scorching Spanish sun to the next station, and quite possibly - to the one after that, until you can find a bicycle. Once you finally arrive to the beach, all the stations are now full, and there's a line of people waiting to return their bici. The stations around Plaça Canalunya and Las Ramlas get packed after 7:00 and empty after 21:00 h.
Sant Gervasi, Eixample Esquerra and Eixample Dreta are chronically left without bicycles. In Sant Marti, the area on the right from Marina and around Poblenou, (which is famous for both lots of start-ups offices and night clubs) has bikes except between 16:00 and 21:00. 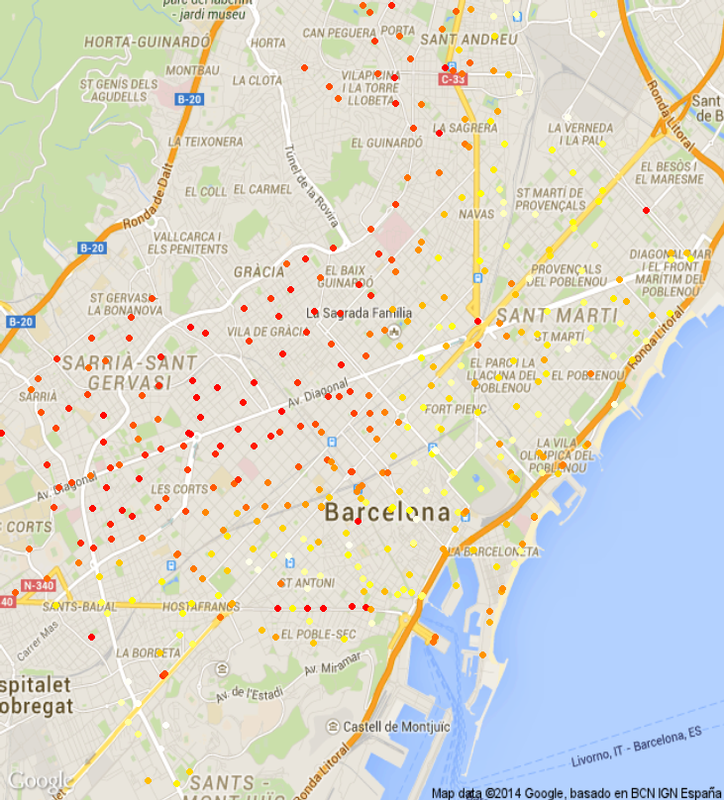 And finally, the area around Navas and Clot empties around 8:00 and fills around 18:00. That's why I can never find a bike in the morning, and can never return one at night. At this level of aggregation of the data, the patterns are not very clear and look rather chaotic. If the Ayuntamiento de Barcelona is willing to make the public bicycles' data public, it won't be too hard to create a visual tracing of the traffic patterns like this one from The Guardian. That will allow one to construct a predictive model that will inform the bicing servicing trucks where and when bikes are needed. If you liked the post, or even if you did not like it - let me know in the comments below. CC BY 3.0. Powered by Blogger.